The deadline for the demise of iGoogle (Now 15 days away), Google’s start page, is getting closer (read how to export your igoogle feeds). While nothing will completely replace iGoogle, there are some alternatives out there. Before we get to the alternative sites we need to define what a Start Page is. For this article a start page is a website that enables you to have various websites, news feeds, and widgets in one place. Most start pages have links to news, popular email services, weather, videos, calendars, To Do lists, maps, sticky notes, TV listings and access to all your social media such as Facebook. In essence, a start page lets you conveniently keep up with a large volume of information in one place. Most have tabbed pages, so you can have a page for each of your interests, RSS feeds, widgets (also known as apps), search boxes, and drag and drop as a way to easily arrange material on your pages. Most have a way to change themes, colors, backgrounds, and layouts. Start pages can open directly in your browser at start-up, or, you can add a bookmark for easy access. Finally, most start pages work well in any current browser. The biggest difference between start pages is in customization and how much material they offer. Courtesy of gizmo’s – Check out the entire article via 6 Great Alternatives to iGoogle. Posted in Discovery, Google and tagged Google. Have a look on igooglealternatives.info . 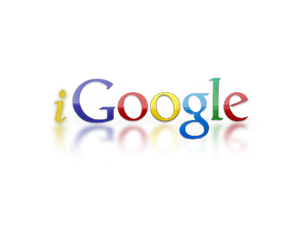 Here you can see top 10 iGoogle alternatives . And I like the scoring system used for each replacement platform.